A classical French holiday home. 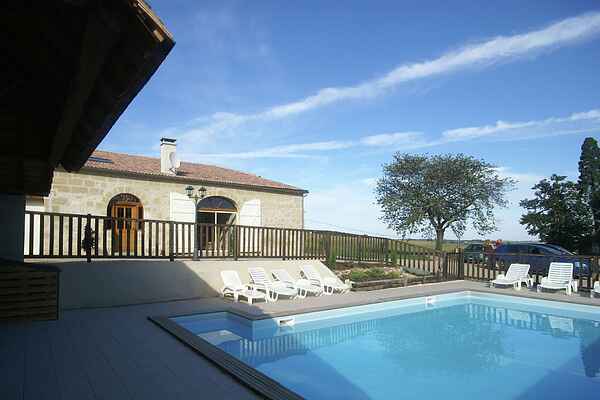 The house is very peacefully and privately located between corn and sunflower fields and the beautiful natural landscape near the village of Puymiclan in the Lot-et-Garonne. This holiday home used to be a large barn. With a lot of TLC, the first part was transformed into a lovely holiday home. The back part is not used. The interior is tastefully decorated and very comfortable. Many authentic details have been retained. The house is part of a large site of around 2.000 m², with a lawn and petanque field where children will have a great time. In front of the house is the enclosed private swimming pool with sun beds. With the swimming pool there is also a partially covered patio with garden furniture and a stone BBQ, which is a great place to spend the evenings. A tennis court and a bakery can be found in Gontaud-de-Nougaret (8 km). There is a supermarket in Marmande (12 km). The recreational lake near Matelis (16 km) is great for sailing and wind surfing, for example. In the surrounding area there are many bastide and fortified towns such as Miramont-de-Guyenne (13 km) and Saint-Pastour (36 km). Golf courses are near Tombeboeuf (12 km) and Casteljaloux (36 km). Entertainment park Walibi in Agen (57 km).